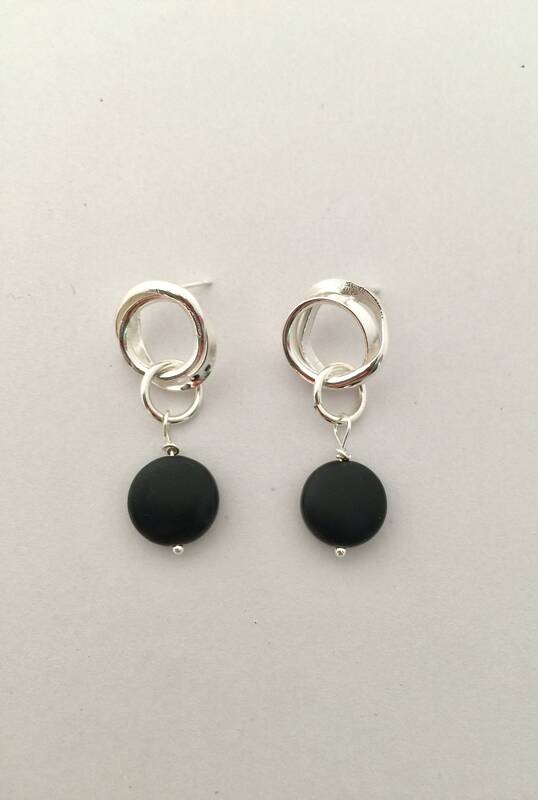 Contemporary and easy to wear sterling silver stud drops with a black onyx charm. I am happy to work with customers on personalised orders! Sizes are detailed with each listing. If you are looking for an item of a different size, please contact me and I'll be happy to make you one. Sterling Silver is a precious metal and may require cleaning from time to time. Using a small amount of silver polish on a soft cloth, gently rub the silver, rinse in warm water then carefully dry. Note: chlorine and bleach accelerate tarnishing and should be avoided. All orders ship in small boxes with the Salt + Water logo. I take great care in ensuring that your purchase is safely packed. Canada Post postage price largely depends on the thickness of the package so shipping costs reflect the size of the item and it's thickness. I currently sell wholesale to local shops and would welcome the opportunity to expand. Please message me for information.